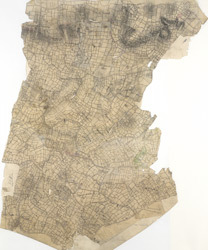 This field sketch of the Kentish flatlands was made on about 19 pieces of irregularly cut paper, which were then joined and mounted on a thick sheet. Considerable mismatch of detail is noticeable along the joins. Buildings are infilled and blocked in red at settlements such as Ulcomb and Sutton Valance. Relief is depicted by rough pencil interlining.